I’ve been a member of Simple Scrapper since January 2013 and my membership has done wonders in helping me accomplish my scrapbooking goals. 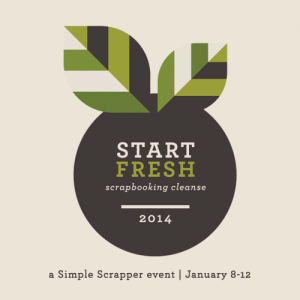 This week I’m participating in Simple Scrapper’s Start Fresh event. Led by Simple Scrapper owner, Jennifer Wilson, the goal of this five day event is to “help you release the excess, create a meaningful plan, and launch into a joyful year of memory keeping.” I participated in their similar event, Plan your Year, in January 2013 and it was so helpful to create some scrapbooking goals, a project calendar, and a way of thinking that allowed me to make smart decisions on my memory-keeping projects. I cannot wait to start 2014 with the same thoughtful plan of action for my beloved hobby. Stay tuned, as I’ll be sure to share what I learned and my memory-keeping plans for the year here at Heartmix, once the event has completed. Though enrollment for this event has closed, with the Simple Scrapper Premium Membership you can participate in similar motivating events throughout the year, alongside an active and inspiring memory-keeping community in a private Facebook group. Simple Scrapper is a scrapbooking website different than many others out there by providing much needed guidance and motivation to make room in your life for what matters most to you in your memory-keeping hobby. With a Premium Membership you also gain access to a library of page sketches, digital templates, and gorgeous layout examples. For 2014, Jennifer has introduced, Spark, a beautiful monthly member magazine to further inspire you in your scrapbooking, its even accessible on your mobile devices. In the past year, Simple Scrapper has become my memory-keeping home. I love the community aspect of my membership and it has become THE place where I share completed layouts, ask for guidance, and gain encouragement and confidence in my scrapbooking. Mindful Memory Keeping receives no compensation for links used, I just really love Simple Scrapper and the motivational memory-keeping events they host. To learn more about Simple Scrapper and their Premium Membership please visit www.simplescrapper.com. Well stay tuned we’ll have lots more scrapbooking and other craft projects to share.